Since 2016, Aga Khan Museum’s World Music Series has been connecting cultures and inspiring conversations. This season the series continues under a new banner of Global Conversations with the rhythms and sounds of Italy, Egypt, Israel, and beyond. Cutting-edge and exploratory jazz meets transcendent, traditional music forms during this high-energy showcase performance co-presented with Toronto’s centre for creative music, the Music Gallery. Land of Kush is a large ensemble assembled and directed by composer and musician Sam Shalabi. A key figure in the Cairene and Montreal jazz and free-improv scenes, Shalabi has gathered a powerhouse group of musicians, comprised of two Cairo natives on the cutting edge of the regional music landscape and a cast of musicians from Montreal’s Mile End scene, centred around Constellation Records who are among some of Canada’s most forward-thinking contemporary performers. Producer/multi-instrumentalist Maurice Louca and singer/electronic musician Nadah El Shazly join members of such bands as Broken Social Scene, Hylozoists, Set Fire To Flames, and more, as well as santur player Amir Amiri, who recently performed at the Museum. Among Shalabi’s many projects, Land of Kush is the most ambitious and impressive: described as “alive in ferocious form,” the group, which involves more than 30 musicians and two dozen different instruments, has never performed outside of Quebec. Land of Kush has released three albums, the most recent of which, 2013’s The Big Mango, is Shalabi’s “love letter to Cairo” written in the wake of his extended stay in the city during the events of the Arab Spring. Round-trip shuttle service from 918 Bathurst St. available for $5. Shuttle departs 918 Bathurst Centre for Culture, Arts, Media and Education (918 Bathurst St.) at 6 pm. Shuttle departs from Aga Khan Museum at 10 pm to return to 918 Bathurst St. Please note departure times are subject to change. Shuttle tickets are available for purchase together with seating for this performance at the “Buy Tickets” button above. Upon adding tickets to your cart you will be prompted to purchase shuttle tickets. If you have purchased tickets to the concert and would like to purchase shuttle tickets, click the following link. Please note: purchasing a shuttle ticket does not guarantee you a ticket to the concert. 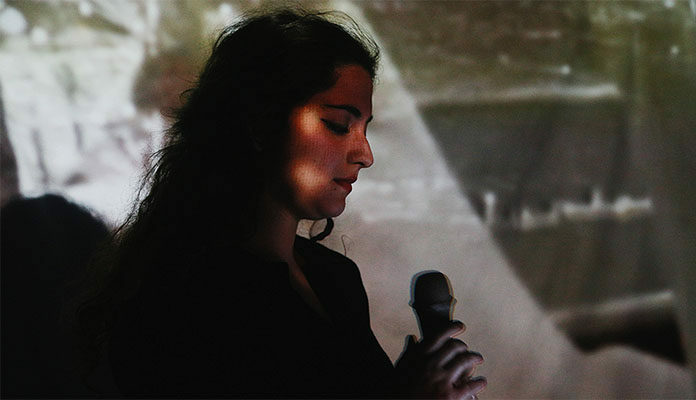 Nadah El Shazly may have begun her performance career in a punk-rock cover band, but her explorations of traditional Egyptian vocal techniques alongside a deep interest in and talent for jazz, classical, blues and electronic music have made her a unique and sought-after talent. Her debut album, which she composed, wrote, and produced in collaboration with Maurice Louca and Sam Shalabi, has been called “an otherworldly experience… [that will] leave you in an altered state, with your senses tingling” (Cairo Scene).